Can You Cook an Arm Roast in a Crock-Pot? Rae Casto began writing professionally in 1982. She writes on a variety of topics including health, nutrition, art and culture for various websites. Casto holds a Bachelor of Arts in psychology and art from Guilford College and a Master of Public Administration in health administration from the University of North Carolina at Pembroke. You don't have to buy beef tenderloin to enjoy succulent, low-fat, flavorful beef. Slow-cooking methods tenderize less expensive beef cuts. The next time you're preparing a pot roast for your friends or family, purchase an economical chuck shoulder cut and rest assured that your Crock-Pot will cook the meat so tender that you can cut it with a fork. 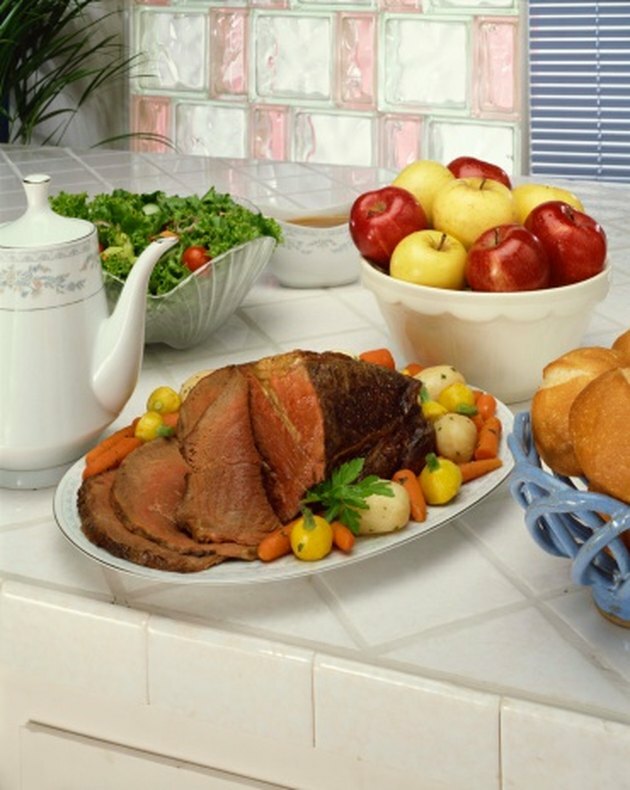 The United States Department of Agriculture includes arm roast -- also called chuck shoulder pot roast -- among 29 lean cuts of beef. The fat content of a serving of shoulder roast is less than 10g of total fat, and it contains less than 95mg of cholesterol. You'll consume more fat from a chicken thigh than from a 3.5-oz. helping of chuck roast. Bone-in or boneless, chuck arm roast comes from the muscular shoulder area of the cow or steer. The Texas Beef Council cautions that this cut of meat can be tough and recommends slow, moist cooking methods such as stewing and braising. Stewing and braising are similar slow-cooking methods -- both require patience and a pot with a tight-fitting lid. To stew a roast, cover the meat with liquid and simmer it for several hours. You can brown the meat in a little oil, first, for extra flavor. To braise, brown the meat on all sides. Drain the liquid and add 1/2 cup wine, broth, juice or beer. Simmer for a few hours until the meat separates with a fork. Crock-Pot is the brand name of a line of electric, counter-top appliances with stoneware cooking crocks. Sunbeam, maker of the Crock Pot, boasts that you can "poach, stew, braise, simmer, water bath, infuse, roast, and bake" in your slow cooker. Set your Crock Pot on high to reach a simmer point of 209 degrees F in 3 to 4 hours, or low to reach the same cooking temperature in 7 to 8 hours. The total time it takes to cook an arm roast depends on its size. A 3- to 4-lb. chuck roast takes 5 to 6 hours on high and 10 to 12 hours on low. Chuck roasts usually contain enough marbled fat to cook without water, but most Crock-Pot roast recipes call for a little liquid. Most importantly, resist the temptation to lift the lid while your roast is cooking. Crock-Pot cooking relies on a slow build-up of heat to cook food. Lifting the lid releases heat and adds more cooking time.